Definition at line 28 of file DestinationIp.h. Definition at line 112 of file DestinationIp.cc. Definition at line 36 of file DestinationIp.cc. References AclMatchedName, SquidConfig::client_dst_passthru, Config, conn, ACLFilledChecklist::conn(), debugs, RequestFlags::destinationIpLookedUp, ACLFilledChecklist::dst_addr, Filled(), HttpRequest::flags, ACLChecklist::goAsync(), Dns::CachedIps::goodAndBad(), AnyP::Uri::host(), AnyP::Uri::hostIP(), AnyP::Uri::hostIsNumeric(), DestinationIPLookup::Instance(), DestinationIPLookup::instance_, RequestFlags::intercepted, RequestFlags::interceptTproxy, IP_LOOKUP_IF_MISS, ipcache_gethostbyname(), lookupBanned, ACLIP::match(), ACL::name, SquidConfig::onoff, ACLFilledChecklist::request, and HttpRequest::url. Definition at line 27 of file DestinationIp.cc. References Acl::TypedOption< Recipient >::linkWith(), and lookupBanned. Definition at line 21 of file DestinationIp.cc. Definition at line 40 of file DestinationIp.h. Referenced by match(), and options(). 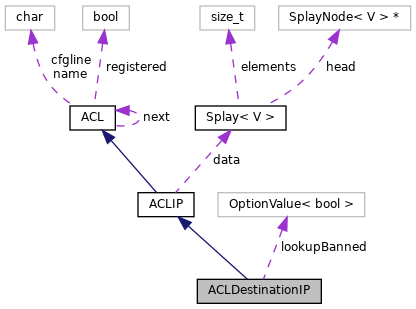 Referenced by ACL::ACL(), ACL::cacheMatchAcl(), ACL::context(), Acl::NotNode::dump(), dump_acl(), ACL::FindByName(), ACLRandom::match(), Acl::ConnectionsEncrypted::match(), match(), ACL::matches(), Acl::NotNode::NotNode(), Acl::AllOf::parse(), ACL::ParseAclLine(), ACLMaxConnection::prepareForUse(), Acl::InnerNode::resumeMatchingAt(), and ACL::~ACL().